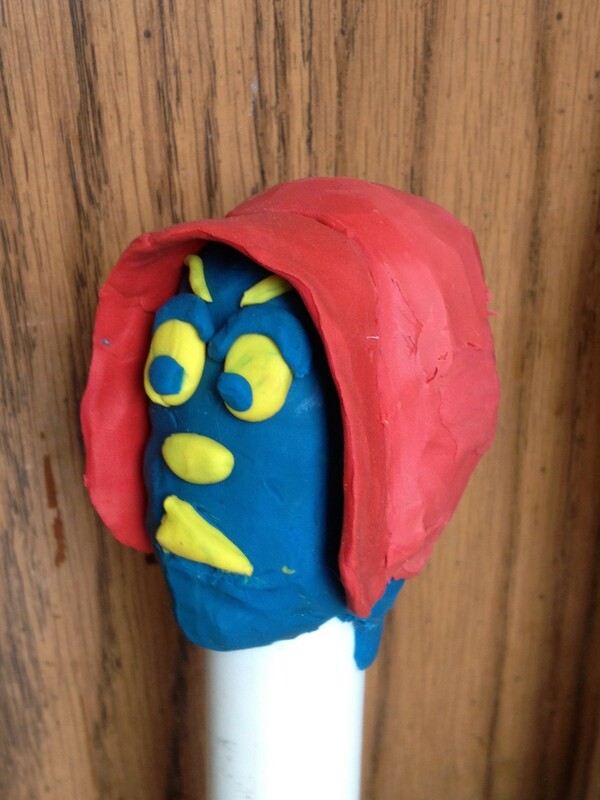 Salem Witch Tales: Production Blog | Follow my progress with my first animated short film! I have not spent time with this blog since last July, but not because I have been idle on the short. With the New Year, I will start a series of posts to try to do some catch-up to where I am now, which is just about finished drawing a solid storyboard for the film, in a way I hadn’t been able to achieve in the past. I’ve been pitching it to anyone who will give me a couple of minutes, and it seems to hang together well. So, watch for the new posts starting Tuesday, January 1, 2013! 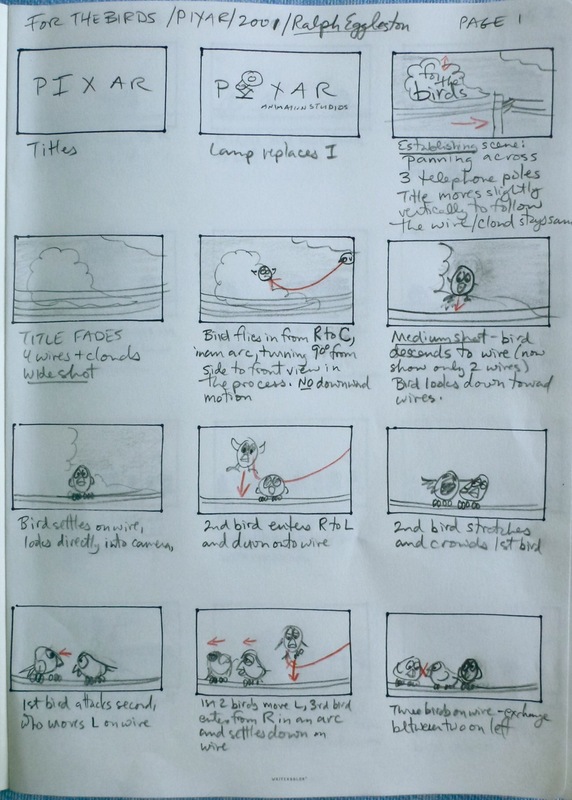 I am taking another class at RISD|CE this summer, this time on storyboarding. 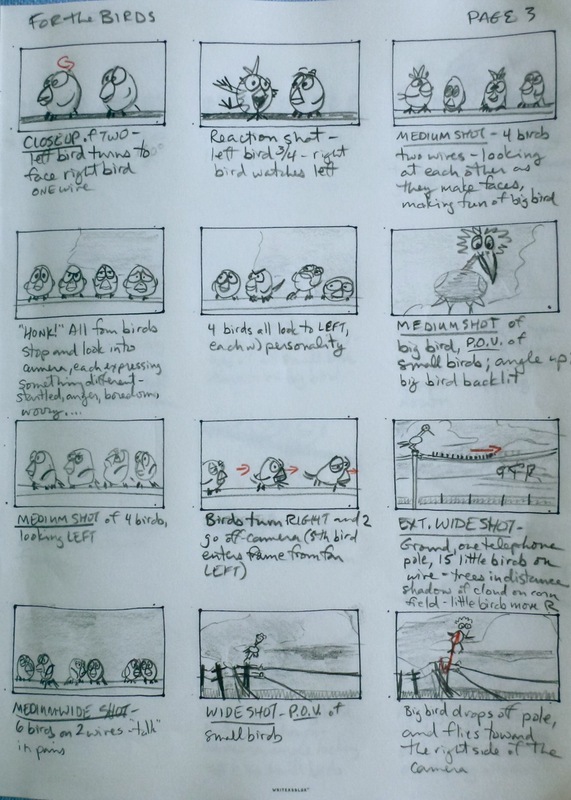 One of our ongoing assignments is to “reverse storyboard” a couple of movies each week. 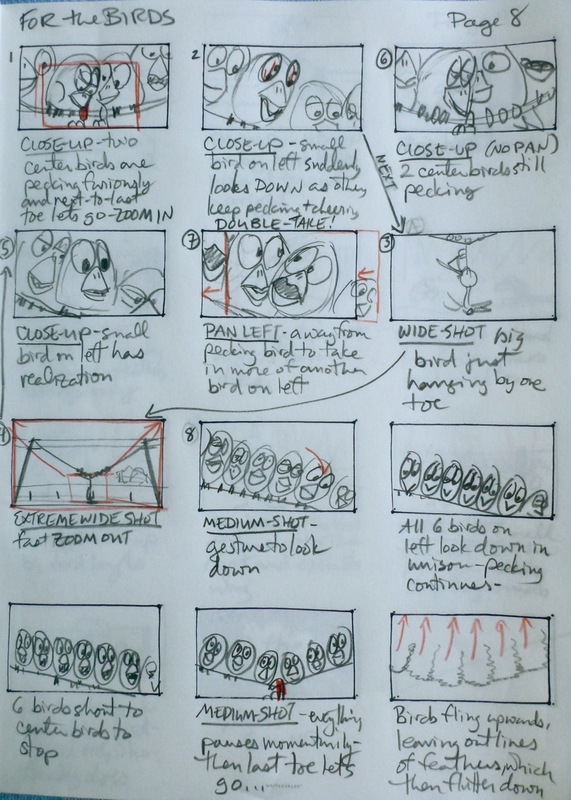 I think I’ve already overdone it: I picked Ralph Eggleston’s For the Birds (Pixar, 2001), which is “only” a little over two and a half minutes long, but it took me a whole day and 107 separate thumbnail drawings to do it! I was exhausted by the whole process of looking so carefully at every little thing going on in the frames and the edits that I think I have to wait a day or so before going back and being able to process, as an overview, what I was seeing at such a detailed level. For the Birds had a lot of cuts, but surprised me in that with a minor exception, the “camera” stays in just about the same spot, and just shifts sideways and zooms in and out. I am reading Joseph Mascelli’s The Five C’s of Cinematography for the class, and it’s really helping me understand what I’m looking at, and to have some vocabulary to use to describe it. I had been thinking about trying Doug Sweetland’s Presto! (Pixar, 2008), but it’s over five minutes long, and I thought I’d start with the shorter one first. Whew! I read that Presto! 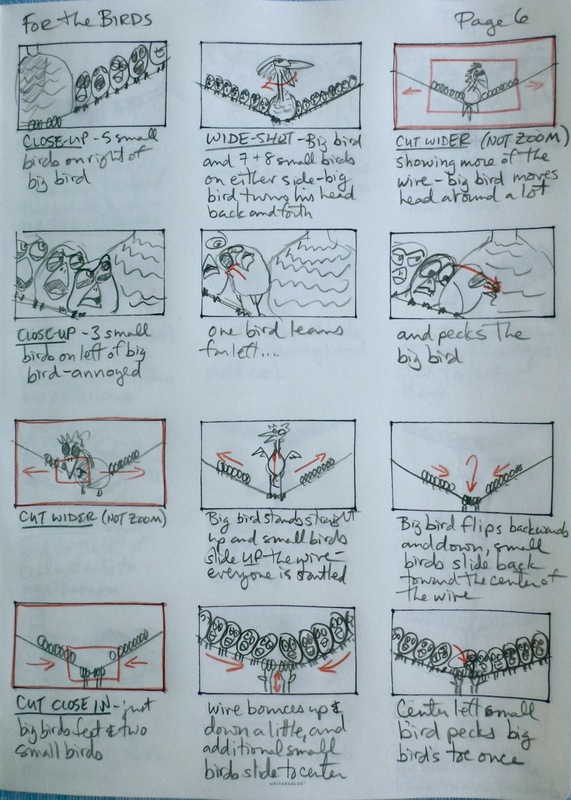 had to be pitched 10 times, and they did over 3000 storyboard drawings to get it to where it is now. 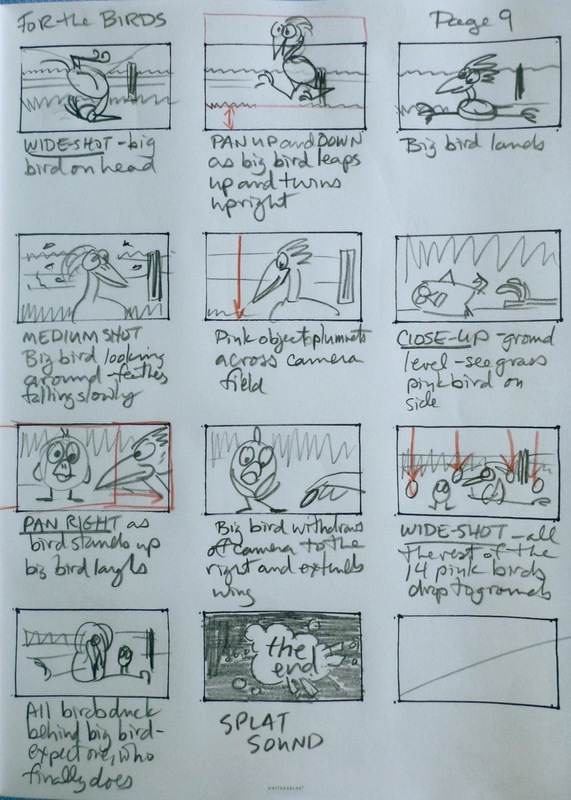 I think I will attempt a briefer reverse storyboard of it, constraining myself to look at only the different camera angles, and not work so closely with all the action, etc. See if that can make the process go a little more efficiently…? I have been looking back at the work I’ve done on my film over the previous three months, and I am struck by two things: the chaos and the order. 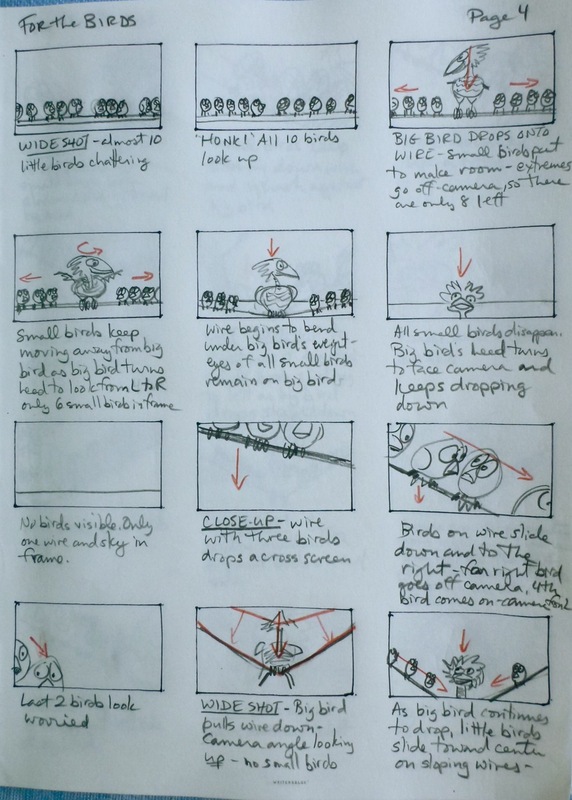 When I started out committing to make this film, I glibly plotted out a sequence to produce it – all in a very linear, sequential, hierarchical way. Efficient. And totally undo-able. It fell apart almost immediately, because I hadn’t gotten even close to having the story laid out, even though I thought I already knew what the story was. I’ve been telling and retelling it for many years now. 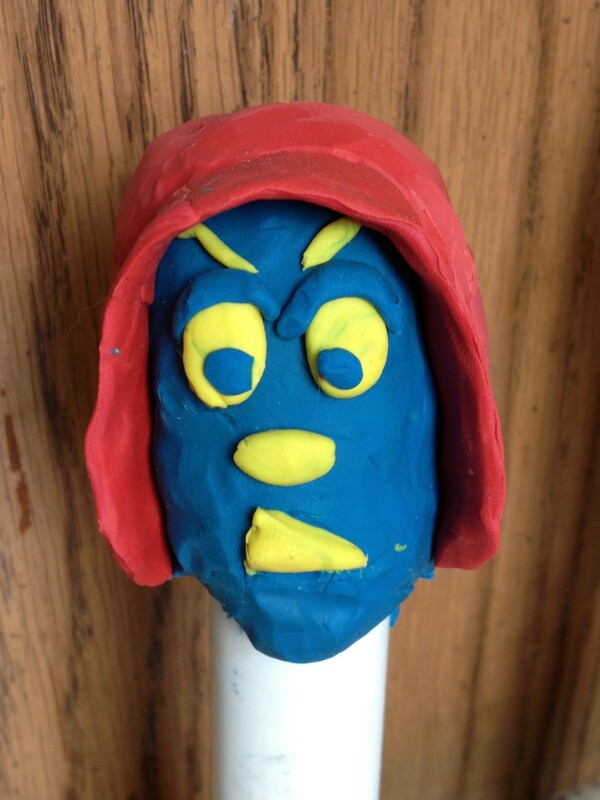 Switching from oral storytelling to a visual medium was difficult. I haven’t been able to really plot out how much time it’s taken me, because the story just percolates at odd times, sometimes when I’m actively trying, and other times, it just pops out totally unpredictably. This doesn’t lend itself well to scheduling, although my experience tells me that co-authoring is easier in that regard: making a date or deadline to hand the work-in-progress over to the other person, or teasing things out together, bouncing ideas off each other. So I haven’t really had this in writing this film – a few people to talk to, some more insightful and helpful than other, but still not a collaborator, and I feel that is a drawback. 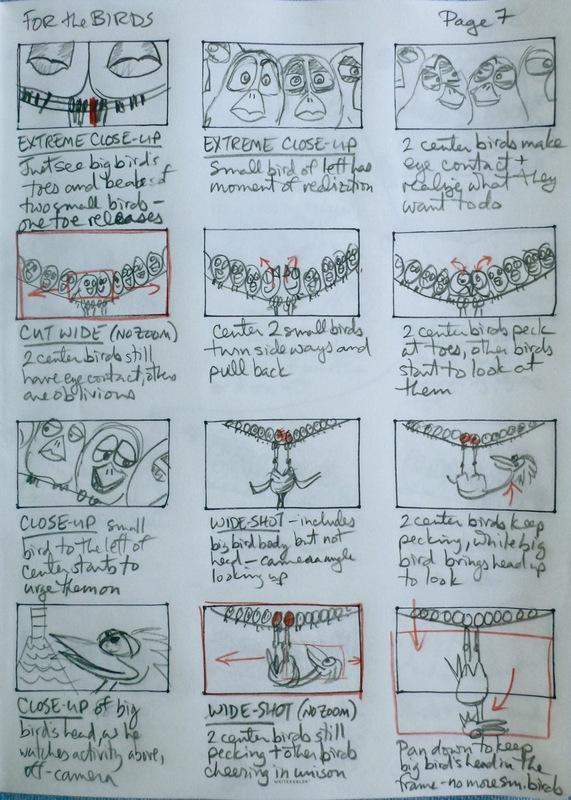 I think about how many great animation duos there have been out there – Ub and Walt, Joe and Bill, Frank and Ollie, Max and Dave, Hugh and Rudy, Trey and Matt – and I wonder if some of the chaos could recede with collaboration. The order has been interesting in a different way. I do feel like when I go at each piece to work on it, I have specific goals, and I can keep polishing it in very specific ways. I realized the other day when I wrote my post about the pig flip that I had every drawing and sequence for that small scene, and I pulled them all out and looked at the progress I’d made, starting with one small doodle, and where I’d gotten with it over time. I also looked at where the pig flip was, and that although I know that it still have some details to go, I already have my list in my head of what still needs to be done – figure out the padding at the beginning and end, and make the piglets slightly more piglet-y at those points, maybe add a head-flop to the sow in the end. But I have a clear sense of what I want it to do. And each revision gets closer and closer. 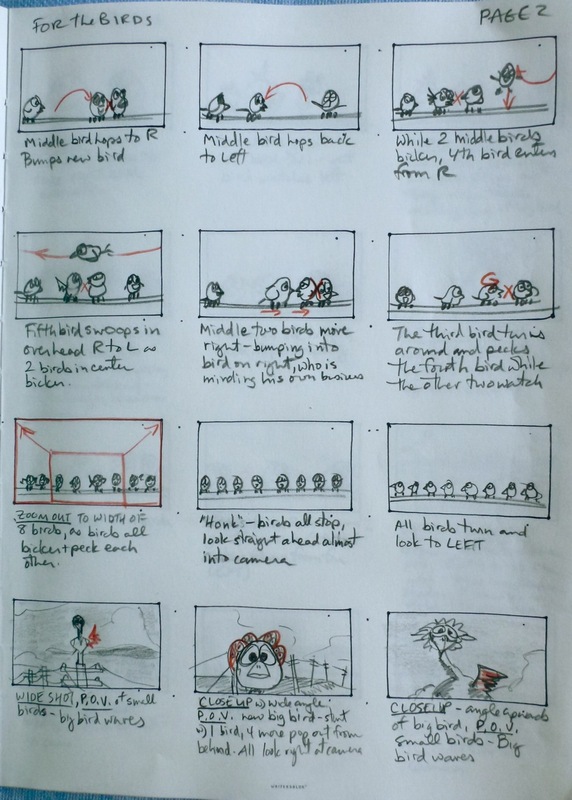 I also noticed that I made a decision to change the “camera angle” on the sow at one point, which changed how the flip read, but it also introduced the piglets, and that complicated the scene. A two-second scene got complicated. This was when having people look at the bit was really crucial: I hadn’t really thought about how people might be horrified by the prospect of the mama squishing her piglets. But I was able to figure out a solution by thinking it through and actually drawing all my arcs for their individual trajectories and vary the landings. And this was a bit of a revelation to me: that this was possible. 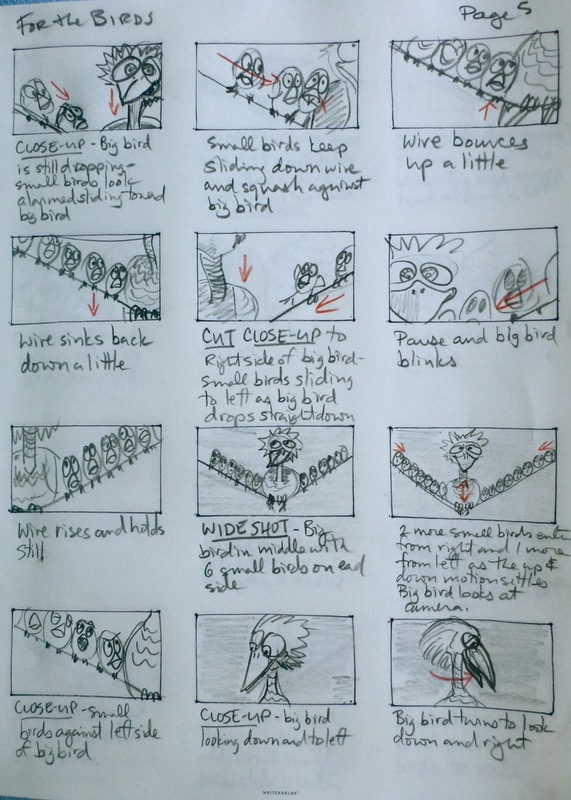 I look at my storyboards – mostly drawn quickly on blank 3×5 index cards – and I can see a sequence, but I don’t think they necessarily communicate a whole lot to other people until after I’ve animated them. 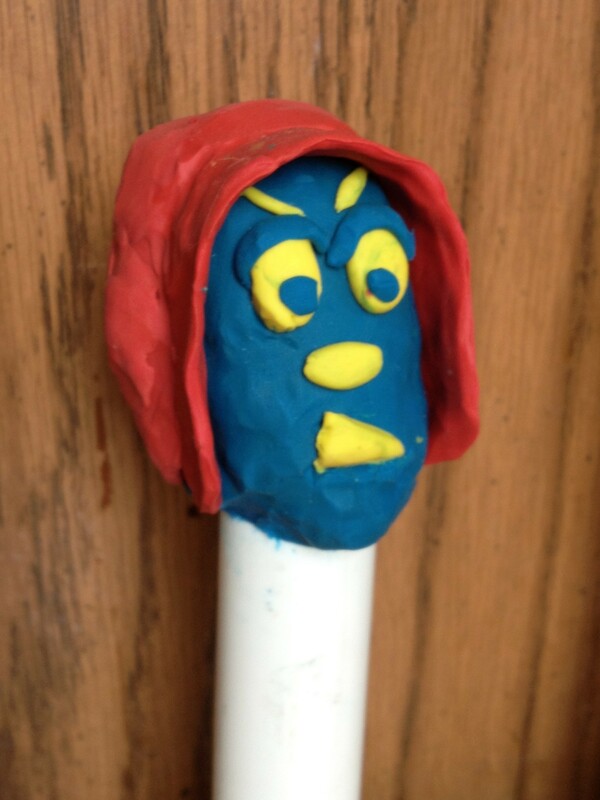 In some respects, even I don’t know what it will really look like until I start animating it. Watching the pig flip develop over time has been encouraging to me, to trust my judgment. 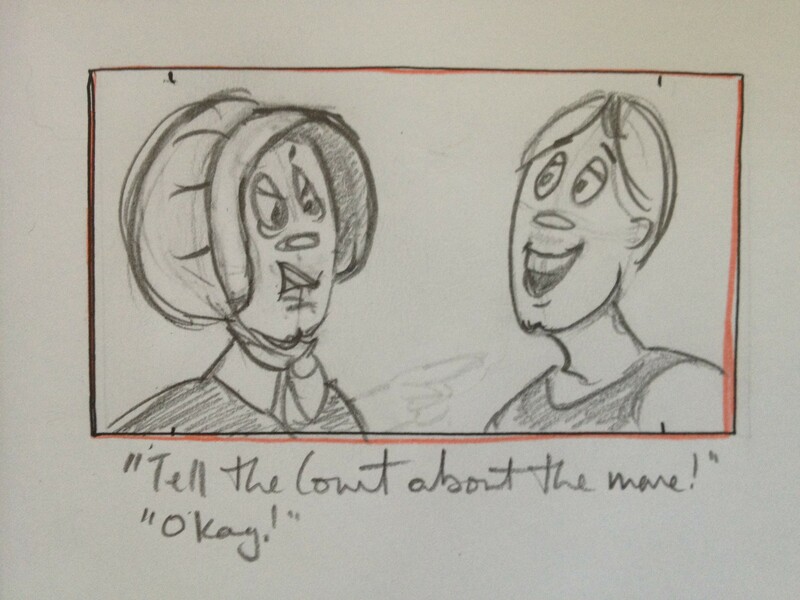 Now that I’m working on the scene with the cow choking on the turnip, and I’m still with the storytelling drawings and it looks all choppy and unfunny, that the chances are increasing that I will be able to make that scene funny, too. The cow’s tongue has special potential. So how does this fit with the title of my post, the Fleischer Studios’ Standard Production Reference? I came across a digitized version of this typed document on-line through a link on the “Support Hand-Drawn Animation” FaceBook group – I’d heard about The Bible a while ago, and had been really curious to see a copy, and lo and behold, there it appeared. What I was struck by as I flipped through the various pages was that it was probably really necessary when having so many people collaborating on each cartoon. 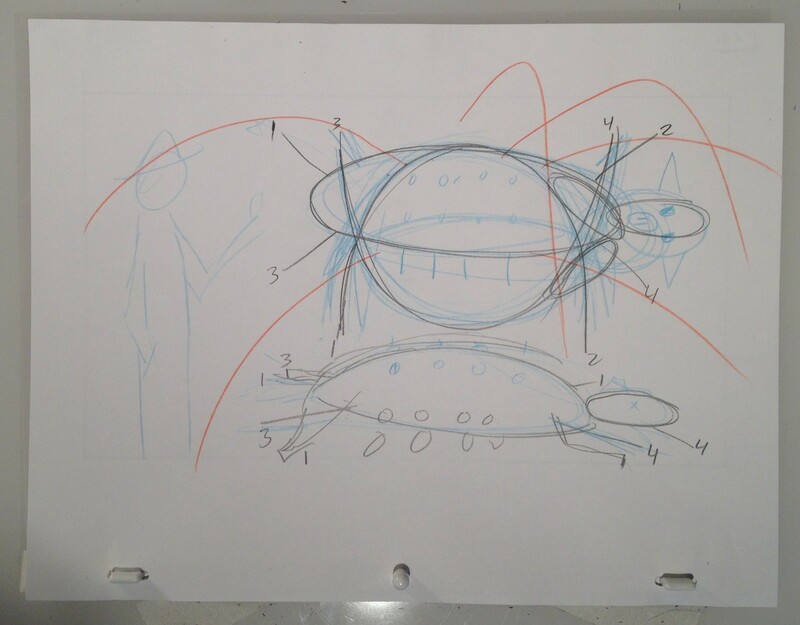 One of the comments even said something to the effect of “If you take drawings/layouts/sheets off someone else’s desk, leave them a note to tell them where they are.” Just rules for making sure that people communicated and were all on the same page. But there were also recommendations for how to achieve efficiency. One note recommended putting scenery overlapping crowds to reduce the need to draw so much detail. Some of these struck me as just good business practice – to reduce the time and expense of a picture for the business, but it also seemed to help reduce tedium, which is ironic when discussing a medium that is already pretty tedious to produce in the first place! 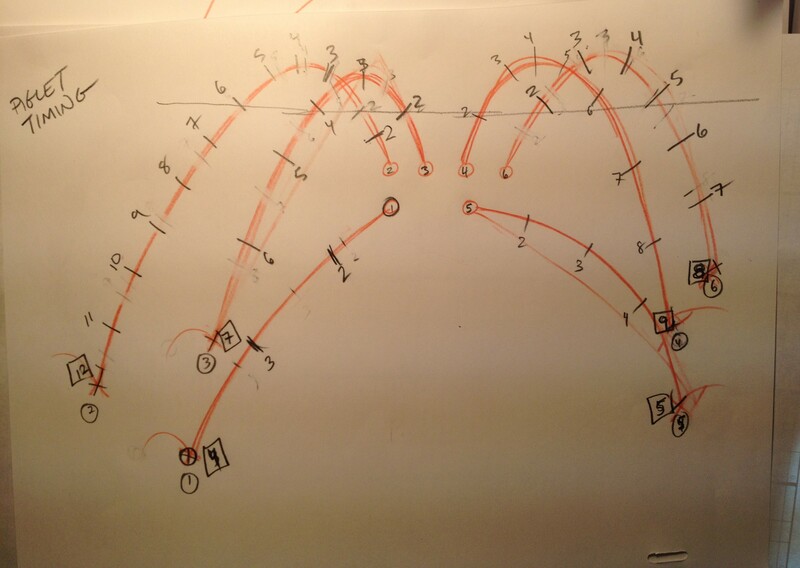 My work yesterday evening was to try to work out the timing for the pig flip with five main positions: start, up, rotate to 90°, rotate to 180°, down. Very brief – two seconds max. In the first attempt I did of this last week, there was a lot of concern by my test audience that the sow was squashing the piglets, so I’m making them fly out of immediate danger of that consequence – see the red arcs. I tried this before running the sequence, so it was a start, but only two of the piglets remained in the frame! There’s a lot of squash and stretch on the sow, which I think works well. Not sure yet what to do with the farmer standing on the left, witnessing this. He is there for scale and composition – I’m not sure I really need him, but I do think about having him catch one of the flying piglets, or have one bounce off of him, if I decide to include him in the final shot. Timing the piglets – they all land at different times. I’ve posted this 2-second working clip publicly to tempt folks to join Vimeo, and let me know they want to see more of the work I’m doing. Milt Kahl, answering Richard Williams’ question. 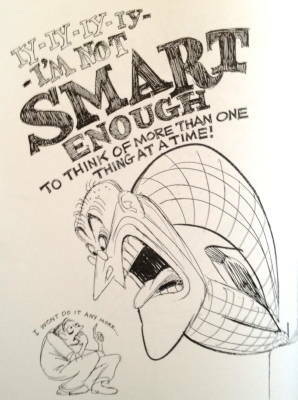 It’s totally wrong to even presume to compare myself to Milt Kahl, but so often in recent weeks, I’ve been reminded of the bit in Richard Williams’ book when he describes asking Kahl if he ever listened to music while animating, and his mentor erupted, claiming he wasn’t “smart enough to think of more than one thing at a time”… I’m feeling like that. Considering the huge amount I’ve had on my plate with the end of the academic year upon everyone at work, my ability to concentrate on anything of my own has simply gone right down the toilet. I know I should be trying to work in small bits, but in many ways, it’s like when I program: I’m in a place where I need to clear out everything else from my skull for some big chunks of time to be able to do it, because it just takes up every bit of my brain’s capacity to figure things out. I don’t think it really was that Kahl wasn’t “smart enough” to do it, but that that kind of concentration demands full access to every spare synapse I have, it seems. I know I get cranky if I’m getting into that zone and something intrudes and demands I divert my attention, even if it’s just a cat, just wanting a little cuddle time: it’s hard work to get into that zone, and when I’m struggling to get into it, it’s a real pain. I can’t imagine ever getting back into it again – although another part of me is certain that I will, since I have done so in the past. I laugh when kids tell me they can “multi-task” – to me, that means one isn’t concentrating, and concentration is the goal. I don’t think one can concentrate when constantly being interrupted, though. I can’t. 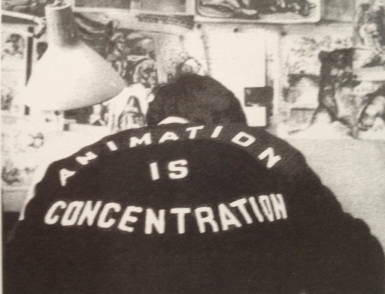 Hence, my motto for the summer, when I will not have people demanding my attention every time I turn around: ANIMATION IS CONCENTRATION. I need to be drawing more, but I come home so exhausted from work, all I want to do is sleep. I need more stuff to keep getting under my skin like this, so I can’t help it, with whatever time I have and don’t have, so I just HAVE to make my stuff BETTER. Crit is in only one week. I have to make the most out of whatever feedback I can get from it on what I’ve done so far with the film, so that when my Kahl-brain finally has a chance to concentrate fully this summer, I can make the absolute most of it. I was listening to This American Life Saturday with a story by Welsh writer/journalist/humorist Jon Ronson reading from his book about the Psychopath Test (I’ve heard it before – it first aired a year ago) and I was captivated by his voice. I didn’t recognize the accent, and had to look him up, to make sure I knew who was actually reading. (Turns out he’s the guy who also wrote Men Who Stare at Goats.) There’s a devious but anxious/wincing tone to it – although that might have to do with the subject matter: interviewing someone he thought might be a psychopath! Great voice! I’m still not sure how I want the voices to work in the film – narrator, farmers giving depositions… I should try to firm up the script this week so I can go collect some voices again, but this time, I think I’ll try to direct the people a little more – there was such a wonderful quality in Ronson’s voice that added so much to what he was reading, it may not matter as much about WHAT they say, but HOW they say it. I will probably have much shorter things for them to say, besides, so I can have them read the lines with different inflections.